This vehicle has been in a couple of times previously where we first fitted an aFe Power full exhaust system with headers, and then back again to fit the MSD intake manifold. The MSD intake didn't do what the customer hoped as it only made 10KW at the wheels extra, at the expense of a 10kW drop in the mid range. After discussing with the customer the next step to improve the performance would be to upgrade the cam, the go ahead was given to get the parts ordered and with the request to use the best parts available on the market for the build. We opted to use Texas Speeds VVT-1 cam upgrade which was the biggest cam available without having to fit a high stall torque converter. As the customer didn't want to loose every day drivability, and with the VVT-1 cam having a 116 lobe separation, it wasn't going to impact drivability too much. An AFM/DOD delete kit was also ordered along side some Katech rocker covers and coil relocation kit to sharpen up the look of the engine bay. AFM (active fuel management) also called displacement on demand) is a feature on modern GM engines where it has unique lifters that enable the ECU to shutdown cylinders at light load to save fuel. This feature can become problematic on performance builds, because the lifter design impedes the amount of lift that can use when fitting larger cam, they also have reliability issues too, with the lifters leaking oil. Once the parts turned up, we got the car back and it was back on the hoist. The first part of the process was removing the heads as the lifter assemblies are under them. So it was off with the bumper, radiator, engine covers, front wheels, exhaust header, intake and manifold, water pump, fuel plumbing, rocker assembly and then the heads themselves. With the heads off we then went on to removing the cam assembly, which involved pulling the front engine cover and sump off, so the cam phase actuator could be removed. The cam phase actuator needed to to be modified with a cam phase limiter installed. Cam phasers are specially designed, computer-controlled cam gears that automatically optimize camshaft timing based on the current engine rpm. Engine oil is pressure fed to the phrases through passageways in the cylinder heads and cams . The engine computers control solenoids that adjust this oil flow into and out of the phasers’ control chambers, giving the ability to retard the cams . While this technology provides fuel efficiency and the ability to always be in the best position for maximum power, regardless of engine rpm, it does present some limitations when it comes to performance cams . With such a wide range of valve timing movement, there is very little piston to valve clearance, which limits you to small cam profiles with little overlap. Because of this, we fitted a Comp Cams 0 degree cam phase limiter which locks the out phase actuator so we could run the bigger cam and not run into any clearance issues. 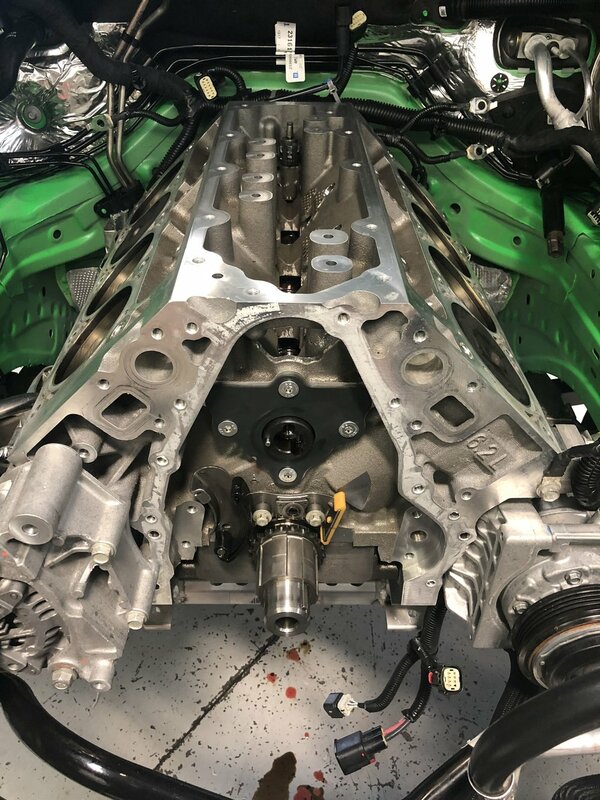 With the phase actuator modified, we fitted the Texas Speed VVT-1 camshaft with a new cam bolt, and new C5R timing chain. Lifters were replaced with a Comp Cams hydraulic roller lifter kit with new lifter trays. and Katech's DOD delete billet aluminium valley plate with new gasket. The new valley plate also required transferring the oil pressure sensor, PCV valve and baffle across from the original valley plate. New GM OEM head gaskets were fitted ready for the heads to re installed. 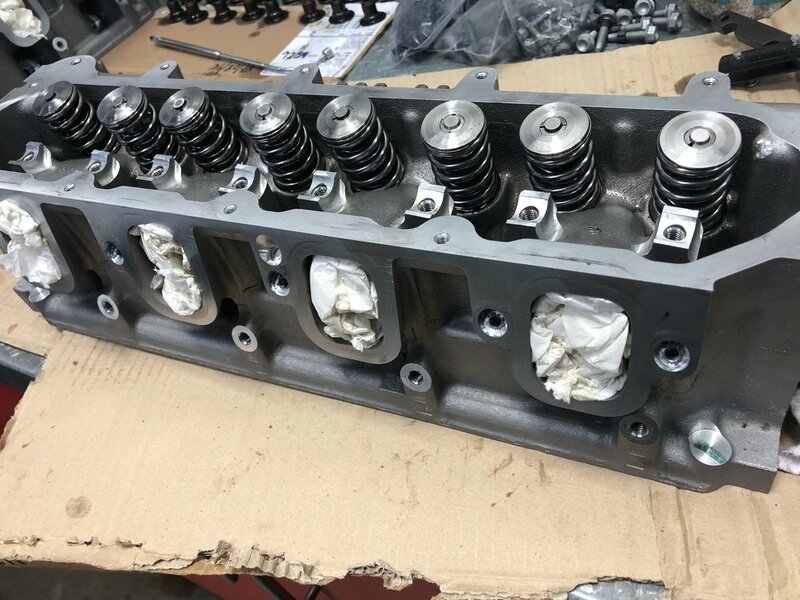 Working on the heads, we fitted Precision Race Components Dual Valve Spring Kit with Titanium Retainers, we also pressed out the existing trunions from the rockers and replace with Comp Cams captured roller trunions which are designed for high-rpm race applications. 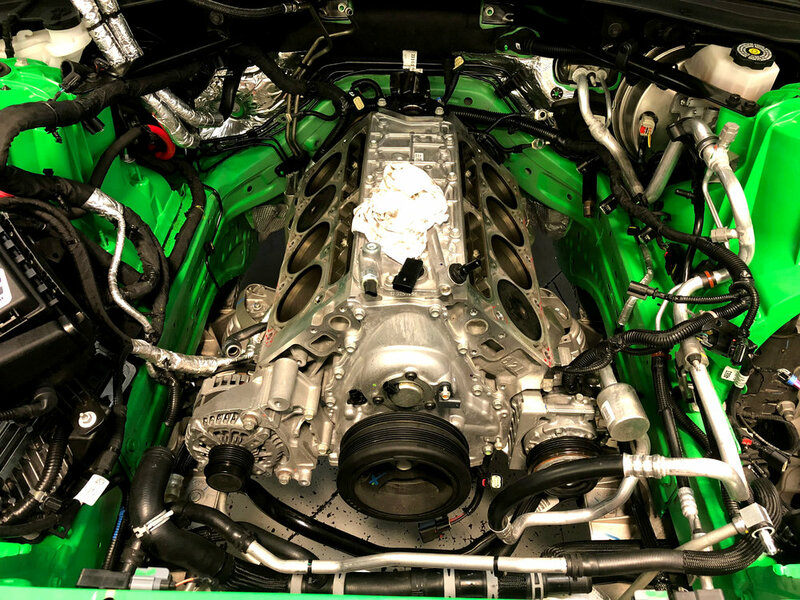 They include the rocker arm trunions, rocker arm bearings, and rocker arm retaining rings for a complete installation to keep the valve train reliable throughout the entire rpm range. 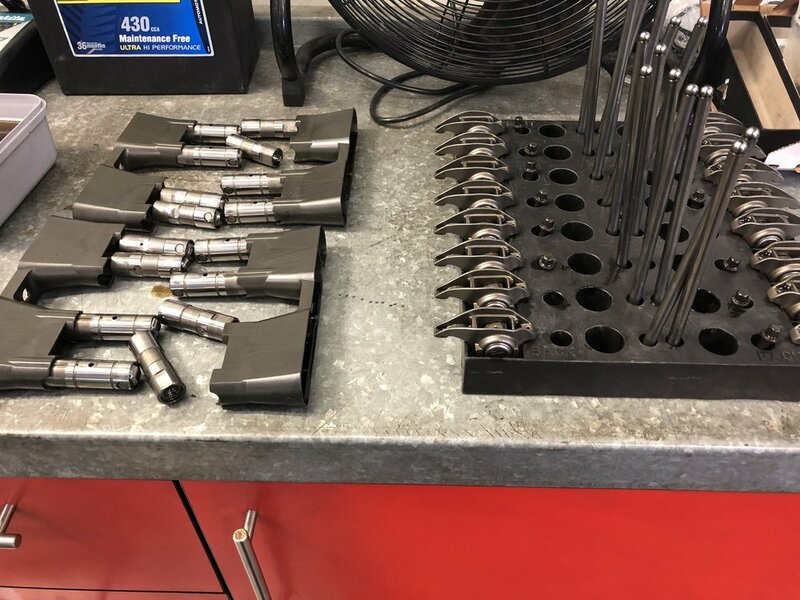 Heads were reinstalled and torqued to spec with new set of ARP's head bolts, and rocker assembly refitted with 7.850" hardened chromoly push rods, everything was ready to put back together. The rocker covers were a pair of Katech Gen 5 Cast Aluminum Valve Covers, as the factory covers have a very shallow baffle plate, and with the extra lift in the cams, it was likely to cause the rockers to hit this baffle plate. The new Katech covers came unpainted, so we sent them away to Wayne Scott Panel Beaters to be painted in the same colour code as the vehicle. When they arrived back we fitted the new breather adapters and coil relocation rails to the covers and reinstalled them on the heads. We then went and started reinstalling everything that was removed such as the intake manifold, fuel assembly, breather lines, coils, and a new set of MSD spark plugs wires as the factory wires were not long enough for the coil relocation kit, we also fitted a new set of NGK Iridium spark plugs for good measure, and then put the rest of the car back together. Back on the dyno for a re-tune, we ended up finishing up with 338kW at the wheels, which is a big jump from 267kW which is where we start when the car first arrived to us. The customer was absolutely blown away with the result and final presentation of the vehicle, he even wrote a nice testimonial for us. "Just finished giving our Camaro a polish and putting the cover on... Although the traffic was very heavy, I loved the drive home. Daniel, Robin and your team did a fantastic job from start to completion. The upgrade parts that you both recommended, from the aFe exhaust through to the Cam etc. were spot on which is why you guys are best in the business and highly recommended in our eyes"